I like that the story is not or wild or frantic which enables more emphasis on plot and character development. Also they're usually set in a small villages or towns with ordinary, everyday characters you can relate to. I enjoy the realistic characters and settings in cozy books. I love the settings,cover and they are clean books! Why I love cozy books is because the are comforting you cuddle up on your rocker on the front porch and a cozy blanket cup of coffee and enjoy the great outdoors and enjoy a good read. I like the fact a cosy has no violence or horror. The feel good factor. Would love to win these books for my mum, who reads a lot. 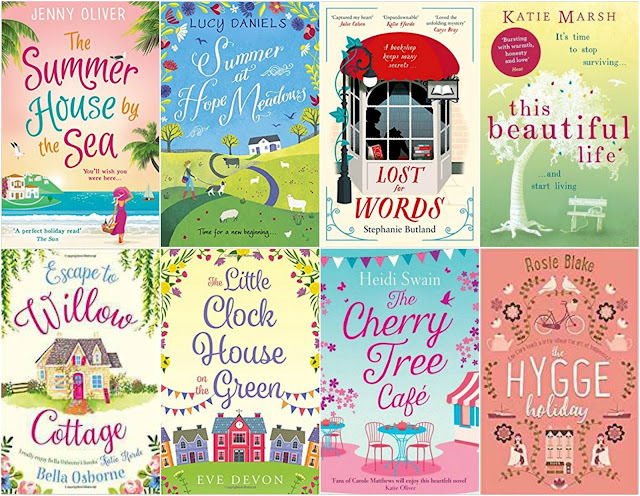 Cozy books are a feel good read- happy ending, a bit funny, a bit exciting a bit romantic- nothing heavy or horrible, perfect for relaxing and winding down. I love how easy and enjoyable it is to read a cozy book. I like the small town settings of cozy books and how they always put me in a feel-good mood with their happy endings. I like the lighter mysteries, no gore. And the fun covers and titles. Plus the quirky characters and usually small town settings. They conjure up a picture of me sunk into a comfy chair by a warm fire with a dozing cat curled up in my lap, reading a book and wondering if I'm the next one to die. I find them very relaxing. That they always give you a lovely feeling. I love sitting reading and feeling that joyous feeling when everything goes swimmingly!! The characters are always interesting. Cozy books just are great to read and help me relax. I like cozy books because they are the perfect escape and help me relax and not think about my worries! While I'm snuggled up reading I'm not doing anything else e.g. hoovering ironing etc!! In a harsh world they lift the spirits. I enjoy a light hearted and much-needed escape from all the depressing things in life. i love that they are not to taxing and help you forget about real life for a while! I like to read a cosy book now and then, inbetween the thrillers that make up most of my reading. It's like having a sleep-in after a long week. A great way to escape the life around you and a guaranteed happy ending. I just love that feeling they give me when I finish reading it. I like how cozy books put me at east and make me happy. They make me escape from my problems and I feel for a little, part of the magic scene! They are so enjoyable! I love reading books ! Thank you! I like that cosy books make me feel warm and happy inside. They're a great piece of escapism. A really relaxing read. They're calming and positive to read before bed! I love the settings in cozies. They always make me want to visit/live in a village like that. I love cozy books because it makes me feel good and relaxed. There's no violence or crime happening very often and if there is a small crime committed people rally round and make sure the victim is OK. Love the fact that people are willing to help complete strangers but also have a lot of time for friends, neighbours and relations. Sometimes sadly lacking in the "real world". They are great for snuggling up with when the weather is horrid too.